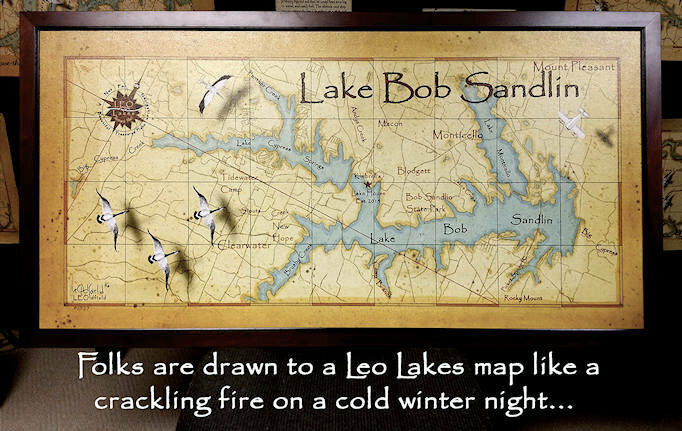 I just finished this beautiful 2'x4' vintage style lake map of Lake Bob Sandlin. The colors came out perfect and they work well with the mahogany frame. I'm sure it will look great hanging in the customers lake house. I've been doing lake, river and bay maps for approximately six years. Over the years, I have experimented with different elements of map art in order to provide the best and most unique map on the market. Folks will be drawn to the map like a crackling fire on a cold winter night. I try very hard to make my maps special by adding interest to the maps. You can add a star or symbol with a few words to mark that special place, it maybe the location of the lake house, the spot where you caught that trophy fish or some grand view. 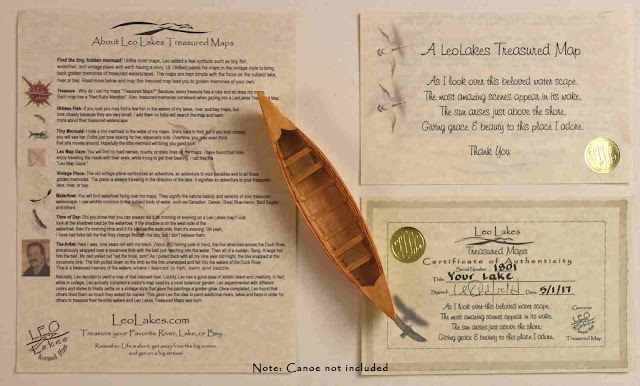 This will make a very special gift for the lake lover. I hide a few fish and even a tiny mermaid in the waters of my lakes. Yep, but they're very shy and don't want to be found. Folks just love'm, especially the kids. You might even think they move around overtime. 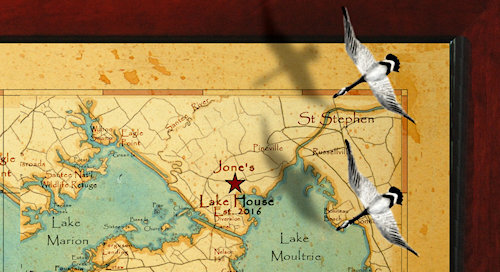 I have hundreds of maps on my website that can be purchased right from the site, or I can do custom and personalizes vintage style lake maps, too. I have maps, such as Lake Bob Sandlin Vintage Style map, Lake Logan Martin Vintage Style Map, Center Hill Lake vintage style map, Lake Texoma vintage style map, Gaston Lake, Choctawhatchee Bay vintage style map, Toledo Bend Lake Vintage style map, Raystown Lake vintage style map. 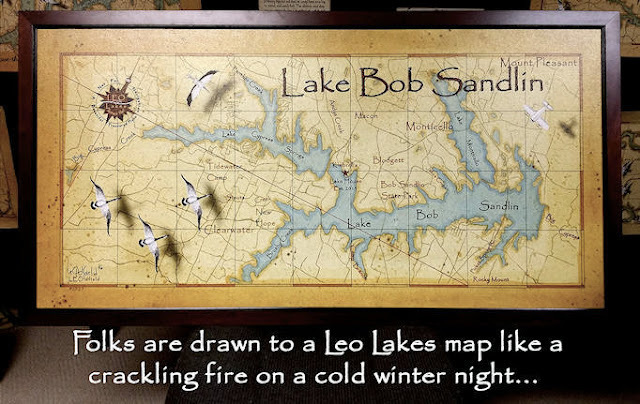 Lake maps will add beauty to your Lake House Decor! Find out more interesting facts about my treasured maps by going to LeoMaps.com.